The U.S. House passed a four-month extension. Now the proposal goes to the Senate for approval. WASHINGTON, DC – The U.S. House of Representatives has passed a four-month extension of flood insurance, leaving it up to the Senate to also approve the measure for it to go into effect. If the Senate does not pass the bill before Tuesday (July 31), the National Flood Insurance Program would expire, which would leave the policies for more than 100,000 Pinellas County residents in limbo during hurricane season, according to U.S. Rep. Charlie Crist, D-St. Petersburg. Crist called on the Senate to pass the extension. “This bill keeps flood insurance strong and clean through hurricane season for Pinellas families, and I urge my colleagues in the Senate to also pass it without delay. Allowing the National Flood Insurance Program’s authorization to lapse would devastate communities like Pinellas,” Crist said. 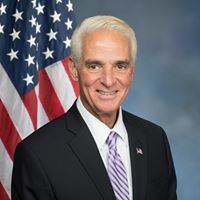 As a member of the House Financial Services Committee, which has oversight of the NFIP, Crist said he has been fighting to keep policies affordable and stable, especially for middle- and lower-income homeowners in Florida’s coastal communities like Pinellas County, and for long-term re-authorization of the program to avert significant disruptions to the real estate market.